(Bloomberg) -- Buying a used business jet is getting harder -- and that’s a sign of a long-awaited shift in the market for luxury planes. Only a dozen or so pre-owned Falcon 7X planes are on the market now, down from about 35 a year and a half ago, says Steve Varsano, an aircraft broker in London. When a client wanted to buy the Dassault Aviation SA model, the tightening market pushed him to bid sight-unseen on a plane in India. Going that far afield would have been unheard-of until recently, so he was surprised to find three other bidders vying for the same plane. Varsano came up empty. The private-plane market is finally tilting toward sellers after years in which a glut of used jets enabled buyers to call the shots. Bolstered by the strong economy and U.S. tax cuts, companies such as Emerson Electric Co., NextEra Energy Inc. and Anadarko Petroleum Corp. are fueling a rebound of purchases. The timing couldn’t be better for planemakers including Bombardier Inc., Embraer SA, Textron Inc. and General Dynamics Corp.’s Gulfstream unit, which are all rolling out new models. New aircraft deliveries are poised to rise 8 percent next year after being flat or down since 2014, according to JetNet IQ, an advisory and forecasting service. The U.S. is driving the rebound while demand from emerging markets has flagged, said Rolland Vincent, a consultant in Plano, Texas, who produces JetNet IQ in conjunction with researcher JetNet. About 70 percent of the new aircraft deliveries have gone to the U.S., which is home to about 60 percent of the world’s private-jet fleet. In the U.S. the reduction of corporate-tax rates -- to 21 percent from 35 percent -- has given companies more cash. The fiscal overhaul also included a rule change to allow full depreciation of capital investments in the first year, which has increased the incentive to buy private aircraft, Vincent said. Bombardier is awaiting certification from the U.S. and Europe to begin deliveries of the Global 7500, the largest purpose-built corporate jet. 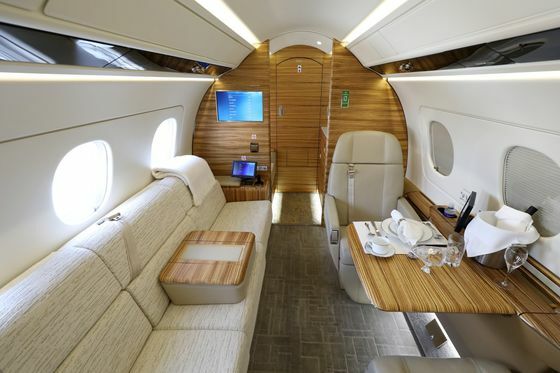 Gulfstream, whose G650 is the current holder of the biggest-jet crown, delivered a somewhat smaller plane, the G500, in September. It expects another model, the G600 to begin service early next year. Cessna, a unit of Textron, is awaiting certification of its Longitude. The midsize jet is bigger than the company’s existing Latitude plane. Not to be outdone, Embraer is increasing the range and improving cockpit controls of its similarly-sized Legacy planes and giving them a new moniker: Praetor. Switzerland’s Pilatus Aircraft began deliveries earlier this year of its first jet aircraft, the PC-24. Demand is also picking up for factory-fresh planes based on older designs. 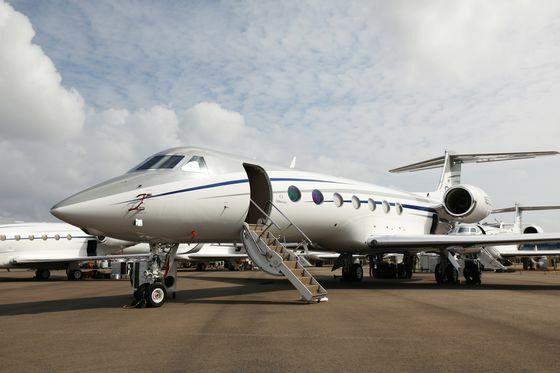 Anadarko, an oil driller, took delivery last month of a 2018 Gulfstream G550, according to Federal Aviation Administration registration records. That was a precursor of the G650 and is still prized for size and range. Anadarko didn’t respond to a request for comment. Synovus Financial Corp., a regional bank in Columbus, Georgia, went in with a partner on a 2018 Embraer Legacy 500. NextEra Energy Inc., the owner of Florida Power & Light, acquired the same model. NextEra and Synovus declined to comment. Emerson, a maker of air-conditioner compressors and automation equipment, purchased a pre-owned 2013 Falcon 7X in September. Stepped-up demand for used planes is important for the overall market because increased purchasing has helped stabilize prices after several years of declines. That feeds into the market for new aircraft as well. The increase in sales of new planes will, in turn, help restore pre-owned inventories as buyers trade in older jets, Justice said. There are still risks. Last week’s stock selloff served as a reminder that the market won’t rise forever. Moreover, the U.S. business cycle will eventually turn. The U.S. economy hasn’t been in a recession since the big one that ended in 2009, which threw the jet market into a downward spiral. 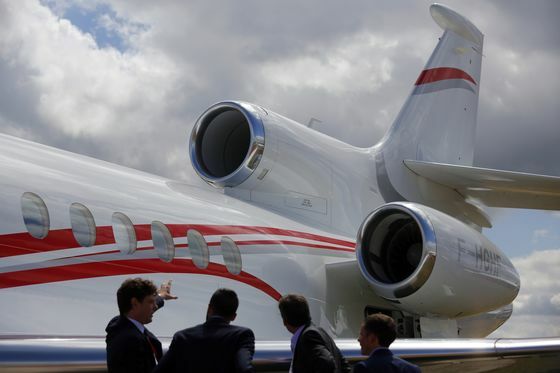 “There’s one bogeyman hanging out there and that’s how long can this U.S. expansion go,’’ said Brian Foley, a business-aircraft consultant who spent 20 years as marketing director for Dassault’s North American jet unit. But for now, with the used market tightening, buyers are adjusting their expectations, said Janine Iannarelli, founder of Par Avion, a plane brokerage in Houston. They have to wait longer for the plane they want to become available or consider buying a fixer-upper jet. Pre-owned inventory is down 13 percent from a year ago, said Gaetan Handfield, senior manager for market research for Honeywell International Inc.’s aerospace unit. For jets that are younger than 10 years, inventory has decreased by 30 percent. The decline bodes well for new sales. Honeywell estimates deliveries of 7,700 planes over the next decade, based on an annual company survey of more than 1,500 aircraft operators. More than 60 percent will be large jets. Planemakers pared production in recent years to avoid oversupplying the market while demand was weak. Now that sales are turning around, manufacturers should be careful not to ramp up output too quickly, Handfield said.